Senate Resources committee will take public testimony on Board of Fisheries appointees tomorrow. UFA opposes Karl Johnstone and we urge you to help by calling in to the committee – and getting others to as well. There will be plenty of people calling in to support Karl Johnstone – we need your help to ensure there are opposing callers! -Mr. Johnstone was blatantly discriminatory against commercial fisheries and the ADFG Comfish division in his previous time on the Board. -Confirmation of Johnstone would leave the Board of Fisheries seriously “out of balance” with respect to commercial fisheries representation. To testify – if you are not in Juneau it is best to go to a Legislative Information Office (LIO) at least a half hour before the hearing begins. If you are unable to get to an LIO, CALL THE LIO NEAREST YOU BEFORE 3:00 p.m to get the Off-Net call in number – See the list of Southeast LIOs below. 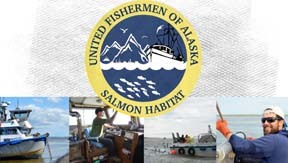 If you are outside of Southeast – see the full list of LIOs at https://akleg.gov/lios.php . The House Resource committee scheduled for Saturday has been canceled. Instead, House Fisheries and House Resources will hold a joint meeting on Monday, April 15 at 6:30 PM in Capital Building 106. Public Testimony will be taken and we urge you to call in. This will be your only remaining chance to testify in opposition to Karl Johnstone. Mr. Johnstone was blatantly discriminatory against commercial fisheries and the ADFG Comfish division in his previous time on the Board. Confirmation of Johnstone would leave the Board of Fisheries seriously “out of balance” with respect to commercial fisheries representation. (OR Go to or CALL THE LIO NEAREST YOU BEFORE 3:00 p.m to get the Off-Net call in number – See the list of LIOs below.